A journal is a page like any other. To create a journal, go to your pages index and create a new page using the plus button on the right side of an existing page. In the card that appears, give your page a name and change the "Page Type" field to "Journal." Your new journal page will appear in your page tree with the title in grey, which indicates that it's unpublished. 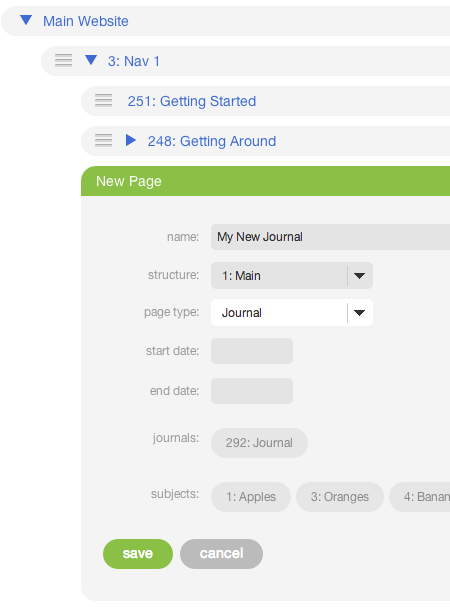 When you're ready to make the journal live on your website, click the cog wheel on the right side of the journal page in your pages index and select "publish." Once you've created your journal page, you'll need to enable one or more of the AR5 journal blocks in order for articles to appear on your journal page. See Journal Blocks.